Scientists are one step closer to humanoid robots. 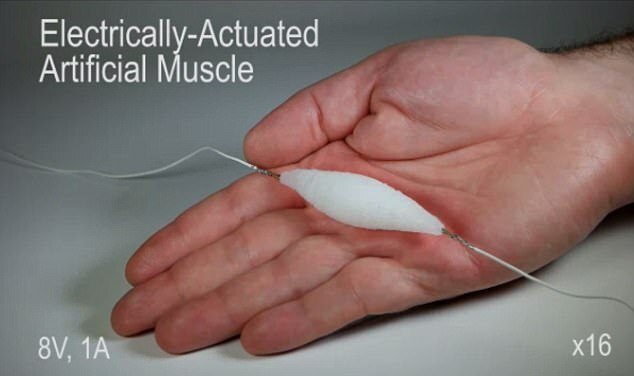 They have come up with an artificial 3D Muscle that can lift 1000 times its own weight. The device in 3D Muscle is also known as an actuator can push, pull, bend, twist and even lift weights. This new device will not require a high power outage or even a separate compressor as did previous models. Scientists are saying that this 3D Muscle is the closest they’ve ever come to a functioning human muscle. The main goal of such a project is to combine artificial intelligence to control this 3d developed muscle. The 3D Muscle is said to have a range of applications especially in the medicine sector such as surgeries. The way the 3D Muscle is developed will allow it to perform in high stress and high strain without being high in density. This study was achieved by lead author Aslan Miriyev. The material derived is easy to make, made with environmentally safe materials and also has a low cost of development. The material developed by scientists combines the elastic properties and volume change attributes of other material systems. After the desired shape is 3D printed, the muscle is made to expand, contract and rotate using a resistive wire and a low power consumption. This 3D muscle was then tested in various settings and in each of these settings it was able to demonstrate significant expansion and contraction abilities. In this testing environment, the 3D muscle was able to expand to up to 900% when heated at 80 degrees. Via the use of a computer this 3D muscle is able to perform any tasks in almost any setting. Up and until now no material was capable of replicating the functioning of a human soft muscle. None of the previously discovered materials was capable of showing the desired properties of high strain and stress. Professor Hod Lipson said that the 3D printed material was capable of showing much promise especially in areas of high human interaction such as manufacturing and healthcare. He continued to say that till date the all materials made were extremely rigid. This limited their applicability. Today with the newly discovered 3D printable material, these soft robots can perform normal functioning such as grasping, manipulating objects, performing delicate tasks and picking up objects. The mobility that such a material affords makes it adept in performing all these tasks. Scientists have made great strides in developing robot minds but robot bodies have remained altogether primitive. With these newly achieved 3D made muscles, scientists are now making great strides in the right direction. This new actuator can now be shaped in different ways depending on the setting it is to be used and its applicability. This 3D printed muscle is the closest scientists have come to replicating human muscle. The material is now being used with different materials such as conductive materials are used in place of wire, which is said to increase the artificial muscle’s shelf life and response time. Dr Aslan further stated that in time these muscles used in combination with artificial intelligence would be a milestone in replicating natural motion. The 3D printed muscle showed great promise when weighing in merely 13 grams it was able to lift a 1 kg object in the testing environment. Researchers are now aimed at using artificial intelligence in controlling the muscle, they say this would be the last milestone in achieving natural motion. With this breakthrough technology, mechanical engineers at Columbia University have said that this 3d muscle will be even stronger than human muscle.